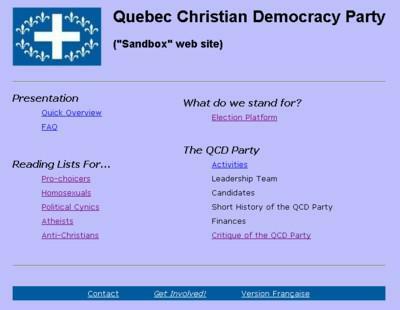 Sandbox website for the QCD Party. 2006-May-21. Note: Warning, this text won't make sense unless you've read the first part. Unfortunately, I don't have a cookbook method to build a good web site for a political party. After having given a few very general rules, I suggest here a few more practical rules, concerning content, access, programming and esthetics. See "A Generic Catholic Election Platform" for the most important part of the contents. 2.1) The electoral platform must exist. By definition, when you ask all voters to vote for you, i.e. to entrust you with one of the most important things in the world (their country, province, city, etc. ), you're supposed to know what to do! It's one of the most important rules, and one of the least respected. If your political party doesn't have an excellent electoral platform on its web site, then your political party should be investing all its efforts to write this platform! Otherwise, don't waste your time fiddling around with a web site; change parties or go start up a new one! 2.2) The contents must be very stable. A web site for a political party is almost the exact contrary of a blog. A blog, basically, is one single person who thinks out loud on the Internet. That person posts what she wants, when she wants, and without worrying too much whether what she's saying is really true or not. But a political party web site must present positions that are very solid, based on serious reflections, careful research efforts in Philosophy and Politics, intelligent debates, and these positions should have been prepared by transitory publications letting these ideas be circulated and vetted. If the contents of the web site (especially the electoral platform) change with the wind, that party isn't serious. 2.3) The contents must be the result of a carefully maintained consensus. By definition, advocating a political party means we agree with what that party stands for. If a political party wants to chase people away, all it has to do is fiddle with the contents of the web site without approval by the candidates, members and supporters. Change without consent is like pulling the rug out from people's feet. 2.4) The official site should be copied on a "sandbox site". Since the site contents must be very stable and approved by the majority, it seems to me preferable to have two web sites: an official web site know by the general public, and a "sandbox site" where the web site committee can make experiments, temporarily integrate the member's suggestions, facilitate discussions on such and such a draft policy, etc. At some point of time, you can send an e-mail to all candidates, members and supporters to ask them to scrutinize the "sandbox site", and maybe vote online to say if they approve or not. If it's approved, the "sandbox site" becomes the new official site. You then do a "Copy-Paste" of the new official web site, in order to start a new "sandbox site", and the improvement cycle begins anew. In my opinion, the "sandbox site" doesn't need to be very secret, since on each page it's clearly said that: "This site is only a "sandbox"! The official party web site is here on the Internet! ", etc. - the items of #3.3 here below. 3.5) These reading lists must be very easy to access. When you are debating in the street with strangers, you want to be able to grab any one of your party's paper documents and scribble a "slashtag" after the web site address, to prescribe the right intellectual and moral medication. 3.6) Ease of access should probably be biased toward newbies and opponents. You can't put links to everything on your home page. Since some things are going to have to be "buried", it's probably a good idea to make your experienced supporters work harder, than newbies and opponents who don't have much patience. For HTML programming as such, see "HTML For Grannies". For more general programming rules, see Sections 2 and 3 of A Few Software Rules For This Web Site. 4.1) The webmaster must be easy to replace. It's ridiculous for a political party's web site to be down for days, or even complete weeks, just because the webmaster is sick, or that he quit in disgust, etc.! (See especially #3.2 in A Few Software Rules For This Web Site to reduce the probability of such a situation occurring). 4.2) The webmaster must not be a bottleneck. The few rare documents which must change often and independently should be uploadable by people who are responsible for them. Some examples: "The news blog", or "The financial spreadsheet", or "The minutes of the executive committee's meetings", etc. Basically, your ISP can set up special folders for you, each having their own username and password. The hyperlinks to those documents never change, so the webmaster is out of the loop. 5.1) Get professional help. Ask for portfolios, examples of web sites that these people consulted on, and chose the best. 5.2) Read good books on the topics. See among others the books by Ben Shneiderman or Jeff Johnson in "Some Good Software Engineering Books"
5.3) Visit good-looking web sites. Simply by keeping your eyes open and taking notes, while visiting many web sites, can help you get closer to a solution. In the same line of thought, videos of party "talking heads" who repeat what is written on the web site don't interest me. But videos of real debates, where we see the arguments of the party's worst enemies being sliced and diced, now that grabs my attention! A good web site is an essential component of any good political party. With the preceding pieces of advice, you have enough information to build one yourself!